There are 27 Assisted Living Facilities in the East Providence area, with 4 in East Providence and 23 nearby. The average cost of assisted living in East Providence is $4,520 per month. This is higher than the national median of $3,346. Cheaper nearby regions include Providence with an average starting cost of $3,712. To help you with your search, browse the 91 reviews below for assisted living facilities in East Providence. On average, consumers rate assisted living in East Providence 4.3 out of 5 stars. Better rated regions include Providence with an average rating of 4.3 out of 5 stars. Caring.com has helped thousands of families find high-quality senior care. To speak with one of our Family Advisors about assisted living options and costs in East Providence, call (855) 863-8283. Home to the Crescent Park Looff Carousel, which is a national historic landmark and among the oldest operating merry-go-rounds in the world, East Providence is a city that brims with history and charm. According to Sperling’s Best Places, East Providence has also repeatedly ranked as one of the best U.S. cities for seniors. Altogether, citizens 55 years of age and older make up an estimated 31.1 percent of the town's population. To help serve this population, East Providence offers four different assisted living communities, with 47 more in neighboring cities such as Providence, Pawtucket and Warwick. Officially known in Rhode Island as Assisted Living Residences (ALRs), these facilities are licensed by the Department of Health, Office of Residences Regulation. ALRs offer room, board, personal assistance and medication administration to residents who don't require a nursing home level of care. • According to Sperling's Comfort Index, East Providence's climate receives a below average score for comfort. Winters in the city can be harsh, averaging 36 inches of snow and a January low temperature of around 20 degrees. • Seniors in East Providence can expect to pay more than the national average for such necessities as groceries and health care. Overall, the city’s cost of living is 13.2 percent above the U.S. average. • The state of Rhode Island doesn't offer any tax breaks for seniors. Pensions, Social Security payments and all other types of retirement income are taxable. • East Providence provides plenty of opportunities to explore nature, history, fine dining and shopping centers. As residents of assisted living communities in the East Providence area, seniors are never far from the historic Crescent Park Looff Carousel, built in 1895, as well as an array of nearby parks and golf courses. • While East Providence’s violent crime rate is on par with the national median, its property crime rate is significantly lower than average. On a scale of one to 100, where the U.S. average is 38.1, East Providence’s incidence of property crimes is only 24.1. • The East Providence area is home to world-class medical facilities, including Miriam Hospital, in the event of medical emergencies or illness. Assisted Living costs in East Providence start around $4,520 per month on average, while the nationwide average cost of assisted living is $4,000 per month, according to the latest figures from Genworth’s Cost of Care Survey. It’s important to note that assisted living rates in East Providence and the surrounding suburbs can vary widely based on factors such as location, the level of care needed, apartment size and the types of amenities offered at each community. 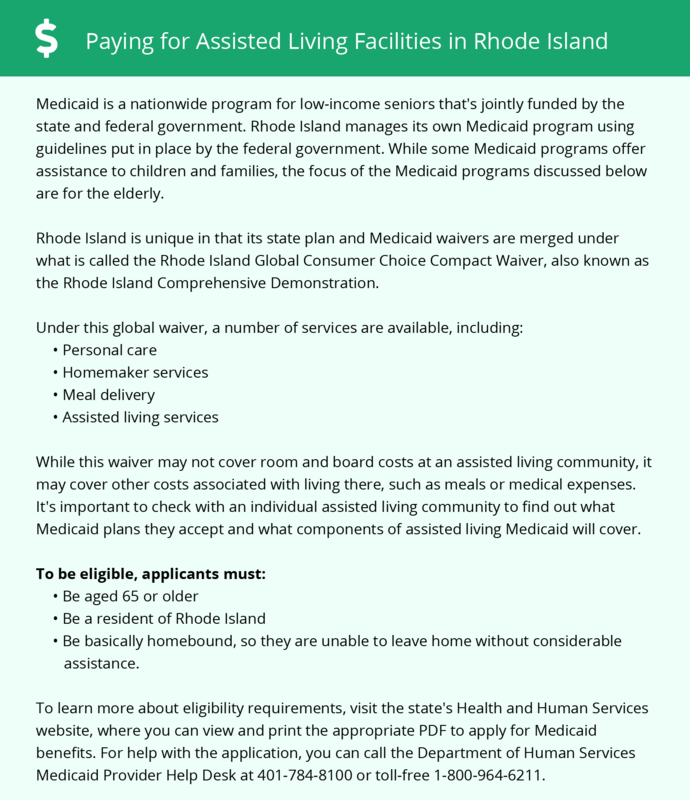 Rhode Island’s Department of Human Services offers a Medicaid waiver program for eligible seniors called the Rhode Island Comprehensive Demonstration that may help cover assisted living costs. The state also administers an Optional State Supplement (OSS) for Supplemental Security Income (SSI) recipients. East Providence and the surrounding area are home to numerous government agencies and non-profit organizations offering help for seniors searching for or currently residing in an assisted living community. These organizations can also provide assistance in a number of other eldercare services such as geriatric care management, elder law advice, estate planning, finding home care and health and wellness programs. To see a list of free assisted living resources in East Providence, please visit our Assisted Living in Rhode Island page. East Providence-area assisted living communities must adhere to the comprehensive set of state laws and regulations that all assisted living communities in Rhode Island are required to follow. Visit our Assisted Living in Rhode Island page for more information about these laws.